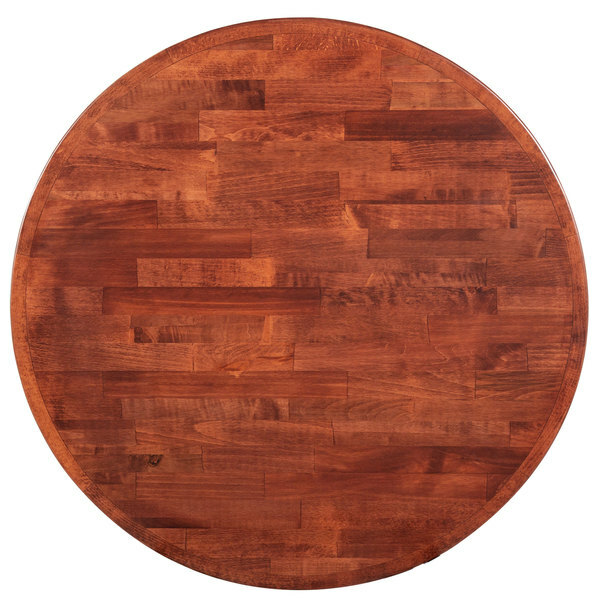 Add a unique, rustic ambiance to your Irish pub, ski lodge cafe, or nature inspired hotel restaurant with this Lancaster Table & Seating 24" round recycled wood butcher block table top! Made from recycled wood, this table top is not only more environmentally friendly than models made from farmed wood, but also provides your establishment with a distinct aesthetic that can't be duplicated. The butcher block style top highlights the natural beauty of the array of different wood species. Beech, birch, pine, ash, and oak are all found in this table top and complement as well as contrast with one another through natural grain pattern variance as well as shade. With a vibrant and rich mahogany stain, each strip of wood accepts the stain differently, giving a uniform appearance while simultaneously allowing each unique species to stand out. Composed of 3/4" solid strips, the wood is affixed to 1/2" plywood for increased structural durability and stability. A 2" thick solid wood border surrounds the perimeter of the table, giving the appearance of a thicker table while maintaining a lightweight composition. It is specially designed to provide you with a dining option that will look fantastic and deliver long-lasting performance at an unbeatable price. Whether you're using it in a restaurant, pub, or cafe, if you're looking for a table top that spotlights the beauty of nature while also focusing on an elegant dining experience, this table is the best of both worlds!